Modified Starch (Contains Sulphite), Sugar, Wheat Flour, Salt, Maltodextrin, Permitted Flavour Enhancer (E621, E635), Chicken Meat and Fat, Onion (Contains Sulphite), Permitted Flavourings (Contains Egg), Caramel (Contains Sulphite), Spices, Edible Gum, Citric Acid and Celery. All food additives are of plant, animal and synthetic origins. May contain traces of cereals containing gluten, milk, fish, crustasean, mollusc, soy, peanut and tree nuts. 1. 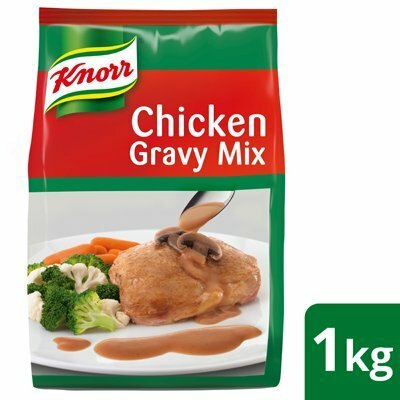 Pour 50g Knorr Instant Chicken Gravy Mix into 500ml hot water.